India is a shoppers dream. You can get lots of beautiful items from textiles, clothing, souvenirs, home decor, jewellery, handicrafts and so much more. 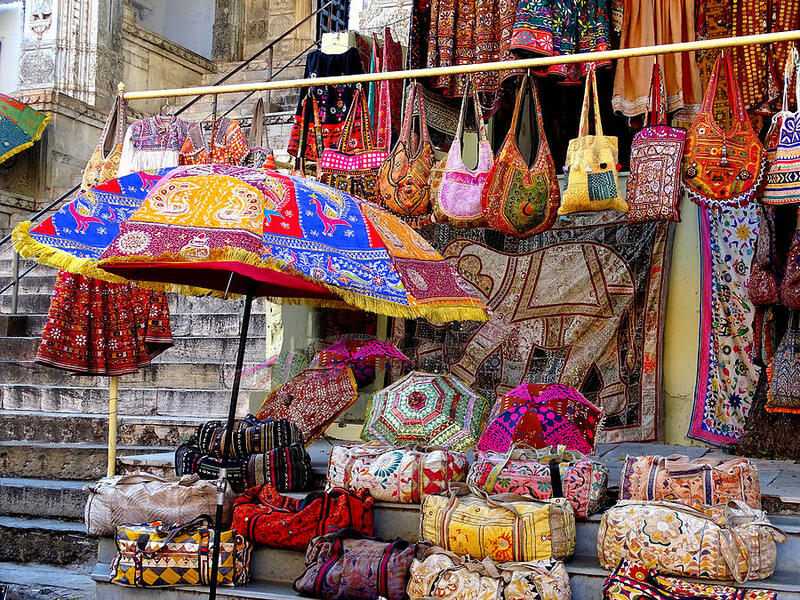 Check out our article for some fabulous places around india for shopping. Delhi comes first in the list of where to shop in India, not only because you can find just about anything here, but also because of the experience. The glitzy malls of Rajouri or Vasant Kunj, colourful Dilli Haat or flea markets of Sarojini Nagar and Palika Bazaar, each has its own charm. Be it haggling in Nehru Place and Janpat Market, and raiding as many as three different markets in a day in Delhi. The City of Dreams is a shopaholic’s paradise. Flea markets, malls, designer boutiques and a number of shopping arcades cater to 12 million people every day in Mumbai! Fashion Street is famous for its latest artifacts, accessories and fancy clothing. Quite similar to the Fashion Street, Linking Road is also famous for its variety of accessories, fancy clothing and artifacts. Colaba Causeway in South Mumbai is an ideal haunt for youngsters and fashionistas not only because of the overwhelming assortment of chic and funky, but also because of plenty of food outlets where you can take little breaks in between all the shopping. Zaveri Bazaar is also situated in South Mumbai and offers the same kind of experience as to Colaba Causeway. Kolkata is the largest shopping destination in East India. Exquisite handicrafts from the North-Eastern states find their way to markets in Kolkata the reason being the tremendous exposure. Some of the famous places worth visiting include but are not limited to Nagaland Emporium and Assam Craft Emporium. Besides these, Kolkata’s specialties are sweets, leather bags, red-bordered saris and books that you can buy at The New Market and from shops at Park Street. The Pink City celebrates shopping in all its hues. The famous Jhohari Bazaar and Bapu Bazaar of Jaipur are gateways to the vibrant world of Rajasthani batik prints, lehariya and bandhanis. The markets are also known for their silver jewelry, lac bangles, other silverware, ornamental home accessories and blue pottery which are affordable, authentic and durable. If solid colors, block prints and Rajasthani motifs are your style, then you can find them on anything from wall hangings, bed covers and rugs to clothes at Shri Mangalam in Makrana Mohalla. Besides jewelry you can buy Hyderabadi Khara dupatta, antiques and electronics from Abids and Begum Bazaar. The shopping districts in Lucknow especially Hazrat Gunj and Aminabad are labyrinths that get denser and noisier as you go deeper. The smallest of shops here can boast of a variety of things. In the city of Nawabs, chikankari work on fabric, itr (perfume) and exquisite Jadau jewellery are absolute must buys. Benarasi saris have singlehandedly made Varanasi (Benaras) one of the busiest shopping destinations of India. Not just saris but silk scarves, men’s kurtas, ties and even unstitched fabric can be bought at Mehrotra Silk and shops around Dasasvamedh Road. Indira Chowk is known for its silver jewelry, shawls, shoes, metal statues, sports gear, electronics, carpets, cocktail dresses and lots more. Beautiful gardens, ornamental palaces, rich cuisine… everything in Mysore has a laid back charm that reflects the city’s royal heritage, and shopping is no exception. From vibrant silk saris and an unimaginable variety of sandalwood handicrafts, to intricate and authentic Mysore paintings, shopping in Mysore is a treat for every art enthusiast. A brilliant list of market places in India! I haven’t been to all of them but ina dilli haat is the pick of the lot for me.